When Steph invited us to her end-of-CNY-fortnight celebrations, I knew right away that I'd try making the Chinese New Year peanut cookies that I saw on Sarah Cooks three years ago (I made almond jelly and melon salad that year). With lard and an egg involved in the original recipe, I had some veganising to do. Sarah left some nice potential adaptations at the end of her blog post. I also couldn't help noticing how much her cup of lard looked like coconut oil so I used the latter as my main binder, added in a little peanut oil, and glazed the cookies with off-the-shelf egg replacer. Limited to salted roasted peanuts from the corner shop, I also skipped the custom peanut roasting and salting the Sarah begins her recipe with. My cookies turned out sweet, crumbly and lightly golden, just as they should. Most of us were too full of deep-fried mock duck and kimchi pancakes to scoff too many cookies, but I loved layering them up like scales on a fish-shaped platter and watching our friend Danni sneak a third one. Preheat an oven to 180°C. Line a baking tray or two with paper. Place the peanuts and icing sugar in a food processor and blend them for about a minute - you want the mixture to be mostly sandy with a few bigger chunks of peanut through it. Add the flour and pulse briefly to combine the ingredients. Spoon in the coconut oil and process again to combine evenly. If it comes together into a dough, skip the peanut oil entirely. Otherwise, gradually pour the oil in a tablespoon at a time until the dry ingredients start coming together. Scoop out about 2 teaspoons of biscuit mixture at a time and roll it into a ball, placing it on the baking tray. When the tray is full, press a single peanut into the centre of each cookie ball. Whisk the egg replacer with a tablespoon of water in a mug, and brush it lightly over the cookies. Bake the cookies for 12-15 minutes, until lightly golden. Allow them to cool for 5 minutes on the tray before shifting them to a cooling rack - they are quite crumbly and delicate. Steph hosted a potluck on Sunday night to mark the end of Chinese New Year celebrations, with dishes needing to be vegan and on-theme. Last time we had a CNY potluck I had a memorable dumpling failure, so I was keen to come up with the goods this time around. I still aimed high - deciding to make a first attempt at turnip cakes for the occasion. It's a bit of a rigmarole - you need to grate and cook daikon, fry some fillings and then make a big loaf that you steam for an hour or so. Our situation was made a bit harder by the lack of a proper steamer in our house - the saucepan/colander solution we came up with worked okay in the end, but it increased my anxiety substantially. Our substitutions: mock jerky for sausage and vego belacan for dried shrimp worked fine, and these fried up a treat in Steph's excellent frying pan (they stuck pretty badly when I tried a couple of test ones at home). I didn't trust the texture to hold up if I made traditional rectangle-shaped cakes, so I went for slightly smaller shapes, which held together well. They turned out a complete success - the high ratio of daikon to rice flour meant that they had a nice rich flavour and they were an absolute delight once dipped in veggie oyster sauce. Cook the grated daikon with the water in a large saucepan for about 20 minutes. The daikon will leech out some liquid - you want to boil it off as best you can, so there's only about 3/4 of a cup of water left. Put the daikon aside to cool for a while. Heat the oil in a frying pan and stir-fry the jerky, mushrooms and garlic shoots for 5 minutes or so, until everything's nicely fried. Stir through the belacan. Once the daikon has cooled a bit, stir it together with the rice flour, cornflour, salt, sugar, white pepper and fried fillings. Leave to sit for 15 minutes and then pour the filling into a baking dish - we used a square one about 20cm x 20cm. Steam the mixture in the tray for 50 minutes to an hour - even after an hour ours didn't seem like it was quite set, but once it cooled down it was fine. We left our loaf in the fridge overnight to set properly, although I imagine it would have been fine after half an hour or so. Slice the loaf into small pieces for frying. Fry in a generous splash of oil for about 5 minutes, until everything has browned up nicely. Serve, with a bowl of vego oyster sauce for dipping. Yellow is a mid- to high-priced bistro in Potts Point, and part of Sydney's fancy Bentley group. They recently hit the news by announcing a transition to an all-vegetarian menu and I happened to be in town for work for their first vego night. 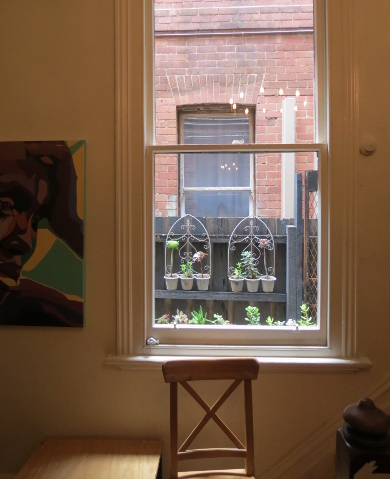 It's a lovely space, with a history as a bohemian arts collective. The exterior is bright yellow and the interior is dark and moody. Service is superb - friendly, knowledgeable and efficient. The new menu has a decent range of vegan options - the staff were very clear that the chef was trying to avoid relying too heavily on the standard dairy, egg and risotto approach to vego dining. The vegan tasting menus on their website look very promising indeed. There's an a la carte menu of about twenty dishes, from marinated olives ($5) up to a salted carrot, quinoa and kale dish ($27). I was dining with a couple of friends and we all decided it would be easier to just take the set menu - 5 courses for $70. You get a couple of tasters before the five courses properly get started - we started with some glorious house-made sourdough. After that came pumpkin crisps with a spread based on toasted coriander. It wasn't clear what was in the spread that came with the pumpkin crisps besides toasted coriander, but it was smooth, creamy and an excellent accompaniment for the slightly sweet and heavily salted crisps. There was still one more dish before the official menu started: pickled brassica leaves draped over a white bean and yoghurt filling. They were tangy and tart and a great mix of textures. The meal proper started next, and I was so keen to get stuck in that I took a bite or two before remembering to take a photo of the first dish: pea mousse with pickled daikon and toasted buttermilk. This dish also played with textures beautifully - the toasted buttermilk crumble adding smoky crunch to the smooth pea mousse, which was dotted with sweet fresh peas. The daikon was slightly sour, cutting through the sweeter mousse. Next up was kohlrabi with enoki mushrooms and vegetable broth. This dish comes out looking like a beautiful flower - not that well captured by my low-light photography. Hidden under the gorgeous pink kolrabi is a pile of tender enoki mushrooms, while sprigs of ice plant provide both greenery and some fresh crispness. Things got a bit heartier with the next dish: black rice, snake beans and koji. I loved this - the discs of snake bean are crunchy, the black rice lightly toasted and the pistachio crumble and koji (weird fermented fungi) kept things interesting. The final savoury dish was a combo of charred leek, pressed curd and black garlic. This was another massive success - the smoothness of the curd soaking up the umami broth flavours and the charred smokiness of the leek and black garlic. Alongside this came a dish that wasn't on our tasting menu - baby potatoes with cured egg yolk and ricotta. It's hard to go wrong with a plate of potatoes and cheese, and the sprinkling of crispy-fried curry leaves on top took this to a whole new level. Our final dish was dessert - a fennel ice-cream with pollen, plums and plum broth. The fennel ice-cream was astonishing - a very Ottolenghi-style mix of sweetness and the unexpected aniseed flavour of fennel. As great as all the savoury dishes had been, this was probably the highlight of the meal, capping off a fantastic array of smart and original dishes that didn't hit a bum note. The people behind Yellow have clearly spent some time planning their transition to vego dining - they had everything working perfectly on day one. I'm looking forward to watching how things develop - hopefully it's a huge success. I'll definitely be taking Cindy there sometime soon. I was sure I'd be first to blog the newly vego menu at Yellow, but Belly Rumbles got there ahead of me and was pretty impressed. Accessibility: The entry is flat, but the interior is quite crowded. Toilets are gendered and accessible. We had full table service. 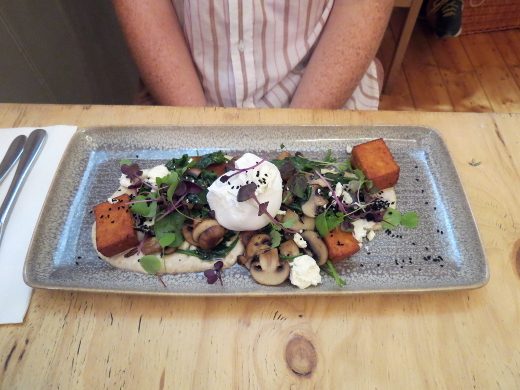 When Maddox first opened on Sydney Road a couple of years ago, we made several pleasant visits for breakfast. It didn't really stand out from Brunswick's consistently excellent cafe culture, however, and we rapidly reverted to our home-ground favourite Wide Open Road. But towards the end of 2015 I started noticing favourable reviews of Maddox on other blogs, with photos showing fancier dishes. The Maddox team even emailed us early in the new year, inviting us back and promising good veg options and sweets. We elected to return anonymously and pay our own way. The menu has had a complete overhaul (perhaps even two or three!). Like The Glass Den, they've taken on sleek but tiny symbols to denote their gluten free, vegetarian and vegan options. Breakfast standards have new accents, with roast strawberry buttermilk on the granola and chickpea chips among the mushrooms. Vegan dishes swap in new components like babaganoush instead of leaving an egg-shaped void on the plate. Intrigued by the chickpea chips, Michael ordered the mushrooms ($17.90). They were sauteed and set upon a smear of babaganoush, scattered with spinach and feta, then topped with a poached egg. He enjoyed the savoury variety of this dish and didn't even seem to miss having toast. While the black rice bircher sounded good, I was most excited to try the week's hotcakes special ($18). These little guys were stout and dense, flavoured and coloured with pandan, with a base that was caramelised and golden. On top? Coconut cream, makrut lime syrup, edible flowers and so many beautiful tropical fruits - dragonfruit, jackfruit, rambutan, lychees and, unexpectedly, a couple of crabapples. It was the best kind of over-the-top. Michael got suckered in to the four-for-$12 cake special at the counter on the way out - he'd remembered the Maddox team proudly mentioning that they're all made in-house. 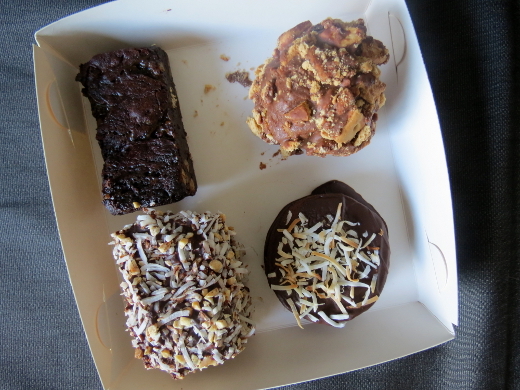 They're a series of cute riffs on well-known treats (clockwise from top-left): salted caramel pecan brownie, a fudgy Golden Gaytime cake ball, a sour cherry and coconut wagon wheel and a peanut butter and jelly lamington. It took us three or four days to demolish them, and they were a delight from start to finish. Maddox has certainly grown up in the long interval between our visits! Their foods have an extra flourish to them now, and these are consistently complementary additions rather than gimmicks (rest assured, it's a freakshake-free zone). It's definitely going back into our Brunswick brekky rotation. You can also read about one, two of our previous visits to Maddox. There was a small flurry of Maddox posts much later at the end of 2015, with positive notes from hungry cookie, frenchtoastandindiepop and INLOVEWITHBRUNCH (partially sponsored); then a mixed account on Melbourne Vita. Accessibility: Tables are closely packed but efforts have been made, including ramps replacing steps and a large unisex toilet with handrails. We ordered at our table and paid at a low-ish counter. We came home from our Ottolenghi-fest with a jar full of pickled watermelon rind and Cindy wasted no time in coming up with a plan to use some. She figured that our Vegan Soul Kitchen book was likely to have some dishes that would benefit from watermelon pickle, and pointed me in the direction of these Johnny Blaze cakes for a Sunday night dinner. These are pretty basic polenta cakes really (certainly much easier to make than the pumpkin and kale stuffed version I occasionally bust out for potlucks). They're relatively dry, with a nice warm flavour thanks to the cayenne and jalapenos. You do need a good accompaniment, and the tangy watermelon pickles were ideal. We also whipped up a batch of the chilled citrus broccoli salad from the same book for a simple buy very effective dinner combo. Combine the polenta, flour, salt and cayenne in a large bowl. Bring the soy milk to the boil in a saucepan and the slowly pour it into the polenta mix, stirring as you go. Stir in the jalapeno and refrigerate the batter for about half an hour. Preheat the oven to 120°C (this is just to keep the early batches of the corn cakes warm while you fry the rest). Add a tablespoon of oil to a large frying pan and place on medium-high heat. Shape little discs out of about 1/4 cup of the batter mix and add them to the pan. Once the bottom has set nicely (about a minute) you can shape them into cakes - you want them about 1cm thick. Lower the heat and then cook for 5-8 minutes on each side until they're golden brown. I was going 4 cakes to a batch and got through the whole mixture in three batches - transfer the cooked cakes to an oven tray and pop them in the low oven while you're frying the rest. We decided to broaden out our Cheap Eats 2006 project by heading south of the river for a return breakfast at Las Chicas, a place we'd last visited almost exactly nine years ago. It's managed to maintain a healthy buzz over the decade, meaning we were confronted with a queue for a table at 11:00 on a Sunday. When we were shuffled in after 10 or 15 minutes we were slotted into the back bench of the courtyard, overlooking one of the most picturesque carpark views in town. The menu is massive and well-stocked with vego items. Vegans have seven dishes to choose from, including coconut sago ($14) and shitake mushrooms with marinated tofu and miso broth ($16). Prices must have gone up since 2007 - our old post has the most expensive vego brekkie at $12, while nowadays you can get a vegetarian big breakfast for $25. Cindy ordered something similar to the dish I had way back in the day - the pumpkin, polenta and sunflower loaf with avocado, feta, pomegranate, fresh herbs and lemon ($17). The presentation is a bit fancier these days and the dish itself was an improvement on my old baked beans-based version - the loaf was lighter and not as dry, with the feta and avocado serving as delicious condiments. The salad was basically all basil, which was kind of overkill, but that was the only minor complaint that Cindy had. 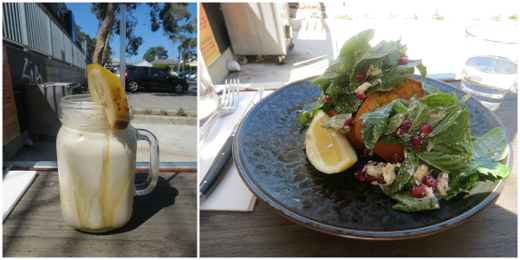 She paired the meal with a banana and honey smoothie with milk and yoghurt ($8). The two feature flavours were prominent and very sweet. I opted for one of the vegan meals - Vik's vegan wrap, an overstuffed wrap filled with broccoli, marinated tofu, mushrooms, onion and vegan mayo and drowning in avocado and a tomato salsa ($16). There's nothing fancy about it, but this is a massive and hearty plate of fresh, tasty food. The vegan mayo was great - not the low-fat Praise option that we usually fall back on - and the mushrooms and tofu provided the rich savoury flavours to balance out the bright freshness of the broccoli and avocado. We were pretty impressed with our return to Las Chicas - the coffee's good, the staff are friendly and they've really got their systems together. Despite the crowds of people queuing up for tables, service was brisk and the coffee and food turned up speedily. They've stuffed so many tables and chairs in though that it doesn't feel like a very relaxed setting - you can't really avoid the feeling that you're being rushed through so they can clear the decks and cram the next group in. Still, the food is great, and the menu is huge and varied - there are heaps of things I'd love to go back and try. We'll just try to make it at a quieter time of the week. Read about our first visit to Las Chicas here. Since then it's reputation has remained strong, with positive write-ups on veg blogs Vegan Sparkles and Nouveau Potato plus loads of omni-bloggers: Eat and Be Merry, for Tomorrow We Die(t), Available All Day, Ichigo Shortcake, Fitzroyalty, The Very Very Hungry Caterpillar, Brunch Addict, Travelling in Mary Janes, msz knowitall, The Baroness of Melbourne, Yum Yum, Juganaut's Foodie Thoughts, KittyBaroque, Mr and Mrs Kong, The Melbourne Glutton, ps: I heart you, SouthSideBrunch, Painting Rachel Red, One Fat Cow, Melbourne Places, Tell Her She's Dreaming, Melbourne Din(n)ing Blog, A Food Trail, My Diet Starts Tomorrow and The World Loves Melbourne. There are just a few people with less than rave reviews - see Howie's Melbourne Food Blog, The Epicurean of Southbank,Yellow Eggs, Juju's Gastronomy and two fat buns. Accessibility: There is a flat entry, but the space is crowded with people and tables. There are a mix of regular tables and higher benches with stools. We ordered at our table and paid at a low counter. Here's a big, bright salad that's been sitting among my to-make bookmarks for a couple of years. We've actually already got a Moroccan carrot salad in our archives; by comparison, this one streamlines the spice list and has a greater variety of vegetables. Their roasting is brief - the carrots retain a hint of crunch while the onions are soft. Chickpeas are just barely warmed through and lemon wedges collapse in your hand, spreading juice and vesicles across the salad. Everything's warmly spiced with cinnamon and paprika, while slivered almonds and dates add extra texture and a bit of sweetness. The original recipe also includes a dressing of yoghurt swirled with pomegranate molasses, but we found that there was plenty of moisture and flavour without it. This salad would make a nice light lunch on its own, with the chickpeas lending just enough substance to satisfy. We teamed it with a watermelon salad for a lovely early dinner, and had plenty left to pack for work. Wash the carrots and trim off the stalks. Slice each carrot lengthways into four or more sticks and place them in a baking tray. Peel the onion, slice it into eight chunks and add them to the baking tray. Slice a lemon lengthways into four wedges and add them to the baking tray. Mince the garlic and add it to the baking tray. Drizzle over the olive oil, then shake over the paprika, cinnamon, cumin and salt. Gently toss the veges around the distribute the oil and spices. Bake them for around 30 minutes - the carrots will still be quite firm, and the onions should be soft but retaining their shape. While the veges are cooking, place the almonds in a separate small baking dish and toast them in the oven, around 20 minutes. Be sure to check them every 5 minutes just in case they need less time - they can burn quickly. Drain the can of chickpeas. When the roasted vegetables are done, add the chickpeas to the drain and stir them to catch some of the spicy dressing. Let the vegetables cool down for around 10 minutes. Use this time to finely chop the dates. To serve, spread the spinach leaves and rocket across a serving platter. Arrange the carrots, chickpeas and onions over the greens; sprinkle with almonds and dates and garnish with the lemon wedges. Our recent morning visit to Ray was handy for making comparisons to our earliest Ray breakfasts in 2007. But we were actually much more curious about the evening menu that the cafe has introduced of late, including a $30 per person vegan degustation on Thursdays. Just two days later we arranged to meet our mate Troy there and get a more extended show of their vegan cheffing skills. Course 1 of 5 was a nice array of finger food - Tooluka olives in sherry vinegar with charred quinoa bread, and steamed edamame seasoned with a lively coriander salt and squeeze of lemon. Course 2 really raised the stakes with molten cauliflower & miso 'cheese' croquettes, sitting atop piccalilli puree. A pretty salad of raw, pickled and fermented vegetables added piquancy and crunch, and included dabs of black tahini and hemp oil. As our third course arrived, it was clear that Ray was willing to provide quantity as well as quality. A dish of crushed Kipfler potatoes was dressed with tarragon and a white wine vinaigrette and garnished with caper berries. I couldn't believe it was bettered by a risotto! This one was barley based, offering both bite and comforting brothiness, made green and fresh with peas, asparagus and watercress. The nooch on the side made it clear that this kitchen knows its vegan staples. The course was made massive with these dense lentil kofta, served in a 'hummus' that reminded Troy of Indian butter chicken sauce, with dollops of macadamia cream and a sprinkling of duhka. This will be the dish that we'll always remember from the meal - hearty yet fancy, with gorgeous spices. 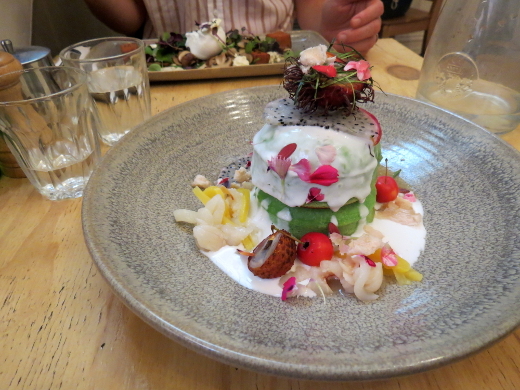 The fourth course was a lovely dial-down, a modest dish of watermelon cubes with a show-off garnish of pomegranate seeds, coconut 'cheese', microgreens and a tart raspberry dressing. We finished up with chocolate - hooray! A rectangle of soy chocolate icecream sat with microgreens and a medley of crunchy and caramelly bits of biscuit, popcorn and smoked almond butter. The more formidable block of 'cheesecake' tasted equally of chocolate and banana, with just a hint of chilli. While we've always known Ray to be a damn good cafe, this did not prepare us for the spectacular bargain offered by their Thursday night vegan degustation. The complexity and variety of these dishes rivals Transformer, yet at $30 a head it's half the price. Mock meat-free and vegetable-centred, it's generously portioned and very filling. (Of course, what's served will vary week to week with produce availability.) Whether you've got a special occasion to celebrate or you're just really very hungry, we urge you to find an excuse to visit Ray on your next available Thursday night. Accessibility: There is a shallow and slightly narrow ramp on entry. Tables are quite densely packed, but there is a clear corridor through the cafe. We ordered at our table and paid at a low-ish counter. Toilets are unisex, fully accessible individual cubicles. I often like taking dessert to Ottolenghi club, and this month I had a special request from our host to make a recipe that had recently appeared in Ottolenghi's Guardian column. It's the kind of recipe that calls for an open mind as much as a sweet tooth, featuring a green sorbet of apple, celery, parsley, basil and tarragon. This herbal curiosity is supported by a more traditionally sweet base of meringue and crème fraîche. The sorbet needs a really good blender to puree all that green produce, and I trialled and rejected our food processor and stick blender before finally blending the mixture in our spice grinder attachment in 3 small batches. (Thanks for washing up, Michael.) Even then I can recommend a thorough straining to really get this down to a velvetty, verdant scoop - imagine how off-putting it would be to find a stray celery string in your sweets. A hefty 300g of glucose syrup keeps the sorbet soft, sweet and scoopable. Ottolenghi's recipe includes baking your own meringues, but I really couldn't be bothered. I just stacked up some supermarket ones with the crème fraîche, confident that this green sorbet would take all of the attention. It sure did! A small serve proved refreshing and unexpected, with just enough richness to satisfy. In a small-medium bowl, whisk together the glucose syrup, lemon juice and water. Pour it all into a large blender. Peel, core and roughly chop the apples; blend them into the glucose mixture. Trim and roughly chop the celery stems; blend them into the glucose mixture. Roughly chop the parsley, tarragon and basil; blend them into the glucose mixture. Continue blending very thoroughly, until the sorbet mixture is as smooth as possible. Strain the sorbet mixture through a fine sieve, pressing through as much juice as possible and discarding the pulp. Churn the sorbet in an ice-cream maker and freezer in an airtight container for at least 4 hours, preferably overnight. When it's time to serve, place a meringue nest in a serving dish for each person. Spoon a tablespoon of creme fraiche into each nest. Gently place a scoop of the green sorbet atop each nest. Lightly scatter the dishes with tarragon, basil and dill leaves. Serve immediately. Our semi-regular Ottolenghi potluck club had its first meeting for 2016 on the January 26 public holiday. With warm weather forecast and a whole day to prepare food, I decided to whip up a couple of salads from Plenty More as our savoury contribution to the spread (the full feast is on display over on our facebook page). My first choice was pumpkin with chilli yoghurt and coriander sauce (pictured above), at least partly because it was pitched as the simplest recipe in the whole book. Given I was turning the oven on to cook the pumpkin, I stuck to the 'roast' section of the book and added the roasted cauliflower, grape and cheddar salad as dish #2. The pumpkin dish was indeed easy - you roast up some cinnamon-coated pumpkin wedges, whiz together a herby sauce and stir some Sriracha into yoghurt and you're done. The results belie the relative simplicity of the recipe - the sweetness of the pumpkin perfectly complements the tangy yoghurt and the slightly salty coriander sauce. The cauliflower salad also proved to be relatively simple (I'm pretty amazed that each of these recipes just have one fresh herb and leave it at that). Again, the pay-off easily exceeds the effort put in - roasting cauliflower really brings out its sweet nuttiness while adding some slightly smoky hints (if you get the charring level right). The remaining ingredients - grapes, cheddar, hazelnuts, raisins and parsley - are just about a perfect combination of flavours and textures. Making these two recipes in one hit is a relatively efficient way to get stuck into Plenty More - all the miscellaneous prep can be done while the pumpkin and cauliflower are roasting, so the whole process should take less than 90 minutes. We've already remade the pumpkin dish once, and I reckon both of these will slip into our semi-regular Ottolenghi rotation. Halve the pumpkin and scoop out the seeds. Cut the pumpkin into thin wedges (about 2cm thick and 10cm long). Leave the skin on. Put all the wedges in a bowl and mix through the ground cinnamon, 2 tablespoons of olive oil and a generous sprinkling of salt and pepper. Lay the pumpkin wedges out on a baking tray (or two) with the skin down. Bake for 35-40 minutes until the pumpkin is cooked through and starting to brown up. Combine the coriander (leave a few leaves aside for garnishing), garlic, the remaining olive oil and another pinch of salt in a small food processor and blitz to a smooth paste. When you've got about 10 minutes left on the pumpkin roasting, pop the pumpkin seeds in on another tray to roast. Keep a close eye on them and pull them out when they've just started to blister and crisp up. Swirl together the yoghurt and the chilli sauce. Allow everything to cool a bit. Lay the wedges on a platter and drizzle over with the yoghurt sauce and the herb paste and then scatter the pumpkin seeds and reserved coriander leaves on top. Toss the cauliflower with half the oil and some salt and pepper. Spread them out on a baking tray and roast for 25 minutes, stirring a couple of times. You want them to come out golden brown. Set aside to cool. Whisk together the rest of the oil, the mustard, the vinegar, syrup and some salt. Add the raisins to the dressing and let them marinate for 10 minutes or so. When you're ready to serve things up put the cauliflower in a large mixing bowl, along with the hazelnuts, cheese, grapes and parsley and then pour over the raisins and the dressing. Toss everything together gently and serve. 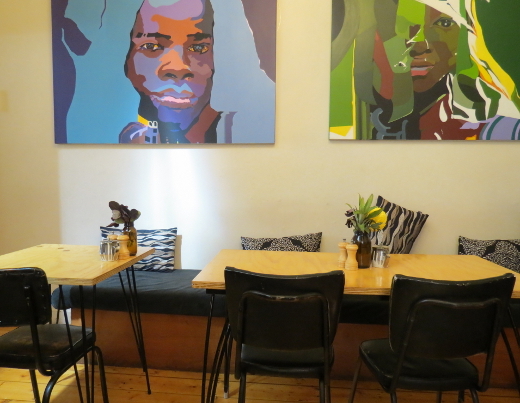 Our Cheap Eats project was a welcome excuse to revisit Ray, a cafe we've long liked. I reckon it might've been the first eatery we visited sporting the exposed brick-and communal table look that's now so ubiquitous in Melbourne. Ray's popularity has motivated an expansion and minor remodel since then, though the ambience is much the same. The menu's had something of a remodel in the last couple of years too. Known initially for its Middle Eastern tweaks to the usual brunch fare (such as dukkah-spinkled poached eggs and French toasted Turkish bread), it's now a haphazard litany of pop culture references with Oatkast and Iron Maiden sitting alongside Avocado Da Vinci. Thankfully their dietary features are clear, with plenty for vegan, gluten-free and halal eaters. Michael took on the handsome Cob Dylan ($19.80), a generous stack of corn fritters topped with a fried egg and augmented with avocado, fattoush salad, radish, pickles and preserved lemon yoghurt. I was momentarily disappointed not to see French toast or pancakes on the menu, but perked up when I noticed the granola and the bircher muesli were both vegan. The Pineapple Express ($13.20) seemed the best analog of the bircher I ordered in our first Ray blog post (just $7 back in '07!). It's a riot of julienned apple, mango, pineapple and berries scattered with "chilli popcorn praline" (actually heat-free popcorn crumbs and tiny toffee shards). They conceal a deceptively dense bircher that I had no hope of finishing. Ray's once outrageously cheap breakfasts are now up at market value, and the menu's had a major makeover. However the service and setting are reassuringly familiar, and we've never had a dud meal there. We reckon it's kept its cool rather admirably this last decade. You can read about one, two, three of our previous visits to Ray. Fellow veg blogger quinces and kale likes Ray, as do omni bloggers The Hungry Grub, BEAN HERE MELBOURNE, CHOMP AND SLURP, the coffee guide... and the hungry lawyer. Reviews are more mixed on New International Students, Available all day and mochii eats. Accessibility: There is a shallow and slightly narrow ramp on entry. Tables are quite densely packed, but there is a clear corridor through the cafe. We ordered at our table and paid at a low-ish counter. Toilets are unisex fully accessible individual cubicles. We were heading in to Richmond for a gig on Monday night, so decided we'd take the opportunity to revisit The Tofu Shop as part of our Cheap Eats 2006 project. This place has been trading since the early 1980s, so it's no real surprise that it's still going strong. The basic ordering process hasn't changed since our first visit in 2008 - you pick your plate size and then select from the bain marie dishes until they've filled it up for you. The prices have gone up, but not by a ridiculous amount - a small plate costs $12, a medium $17 and a large $26 (compared with $8, $15 and $17 back in the day). I ordered a medium dish and let the staff work out a selection for me - there was lots of good stuff in this bowl, including: broccoli with sweet chilli tempeh, potato and black-eyed beans, chilli jam tofu, chickpea curry, baked zucchini with paprika, feta and garlic (this was the only non-vegan dish) and pickled cabbage salary with celery. Cindy had a small bowl and picked out her own flavour combo, topping things off with a big dollop of tofu dip and pickled ginger. The food is excellent - fresh, healthy and loaded up with vegetables. It's very reminiscent of Munsterhaus (which originally had some sort of Tofu Shop connection), right down to the same tempeh broccoli dish. Smooshing all the dishes into one plate makes the flavour combinations a little tricky, but it somehow seems to work okay. We left enough space to try dessert - a piece of the apple crumble with a serve of vanilla malted soy ice-cream ($9). They've ditched the soft-serve that they used to offer, but still have a selection of five soy ice-cream flavours (4 of which are vegan). I quite liked the ice-cream, but it was a bit too tofu-y for Cindy. The apple crumble was pretty bland, sadly. The Tofu Shop is a reliable source of healthy, flavoursome food. It's been dishing out the goods to Richmond people for decades and the steady stream of people dropping by to grab takeaway suggests that things are still going strong. The prices are a bit steep, and the space itself is nowhere near as nice as the otherwise similar Munsterhaus, but it's a speedy and delicious option if you're in the neighbourhood. Read about our first visit to The Tofu Shop here. Since our visit, it's been positively reviewed on vego blogs In the Mood for Noodles and Veganopolous, plus non-veg visitors Poppet's Window, Gastrology, I Talk Too Much My Mouth Hurts, New International Students, Who Told You That?, mochii eats, Olive Sundays and MEL: HOT OR NOT (although there are a few complaints about the prices). KT Eats the World and Sweet and Sour Fork were less impressed. Accessibility: The door has a small lip owing to the street-level incline. Things are pretty spacious inside, with only high stools to sit on or a lower outside table (see top photo). We ordered and paid at a low-ish counter. We didn't visit the toilet. We've revisited The Glass Den for Sunday breakfast again, this time in the company of the Moody Noodles. The cafe has changed their menu since our last visit but the abundant vegetarian, vegan and gluten-free options remain, including the wonderful coconut hotcakes. Dietary features are marked with pot-plant symbols that are cute but call for extra concentration. Michael ordered the vegan breakfast soba ($16.50), a beautiful bowl of green tea soba noodles, sauteed kale, garlic polenta-crumbed oyster mushrooms, pine nuts, smoked coconut and kale sesame crumble. The mushrooms looked and tasted amazing, and Michael enjoyed this rare breakfast-noodle experience. I took on the somewhat deconstructed black sticky rice pudding ($14). 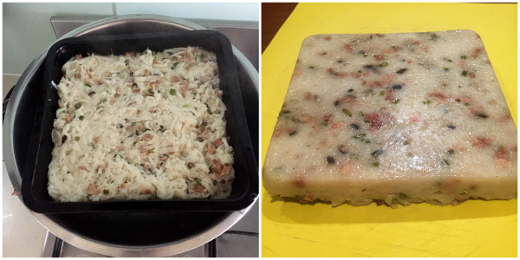 The sticky rice was molded into a dense cake that retained the rice's moisture and chewy texture. In this set-up I found the coconut mousse a teensy bit cloying, but there was bountiful fresh mango to lighten the plate. The odd crunchy moment from the popped quinoa and candied almonds was pretty great too. Service was a little sharper than on our first visit, the food was just as pretty and tasted at least as good again. (Only their soundtrack is consistently not to my taste!) We reckon The Glass Den is holding a pretty high standard. You can read about our first visit to The Glass Den here. Since then it's received positive reviews on Veganopoulous, quinces and kale, and ordinary girl, extraordinary dreamer.